Better results with a newfound inclusion. Instagram screen capture of Goddess Pendant resn faux opal shown in different lighting. Karen A. Scofield. Why Trial Runs Using Magic-Glos Resin? Lisa Pavelka’s Magic-Glos UV Resin allows me to work fast (layers cure in 15 minutes), build a focal bead in layers, and experiment. I’m using this resin to try out some new products, techniques, combinations, and sequences as I learn my preferences in resin faux opal making. So, here are some of my best results so far, note the slight amber tone at this depth with this resin, and I’m about to Faux Opals in Ice Resin and ArtResin. (See How to Ice Resin, How to ArtResin.) At this thickness, I expect almost no amber tone with Ice Resin and no detectable amber tone with ArtResin. 1. Don’t seal paper or cardstock inclusions with Mod Podge or PVC (white craft) glues if you’re using them with Magic-Glos — reactions between water-activated mediums, inks, and Magic-Glos can occur over time. 2. Bubbles can be prevented almost all the time. Read resouces given here. Bubbles can be removed by letting cured item sit one hour, drilling a hole into the bubble, cleaning up drilling debris, adding just enough Magic-Glos, and curing again. Air–dry glues — air-dry glues get trapped under things, don’t cure 100%, then release air bubbles into your curing resin. Use two-part epoxy glue instead! If in doubt, test first, often weeks ahead to make doubly sure. Don’t. Don’t bake Magic-Glos. Avoid temperatures over 100 degrees F. See MSDS. Warning: Baking Magic-Glos with polymer clay will cause the resin to amber (brown). See MSDS sheet (link given above) for further info. Doming, Pulling Away, and Self-Leveling Properties and What They Mean to the User — The same properties that allow Magic-Glos to dome causes the resin to pull away from edges/periphery in first layer or two, hence a good dome is built up in layers, each of which are cured before the next is added. The last layers are minimal amounts and it may help to spread the resin nearly to the edge (with a toothpick or small ballpoint stylus) and then let Magic-Glos self-leveling finish the job, finally fully covering evenly and doming. Let it sit 10 minutes to 1/2 hour out of UV light to let it finish self-leveling and to let air bubbles make themselves evident. The self-leveling properties mean that you might think you only added enough, the self-doming is a bit of a delayed reaction, and then suddenly you have Magic-Glos running over the sides. If still uncured, it can be cleaned up with cotton swabs and wet wipes but prevention is better than damage control. Prevention involves adding thinner, multiple layers that are each cured before the next is added and curing your item while on a pedestal — a bit of polymer clay or poster-tx on a craft mirror a bit larger than your piece but small enough to fit in the UV lamp oven. If the overfill cured, it can be pried off with your hands and/or chipped off with a craft knife. Minimum Number Of Layers — usually 2 layers, less is more, meaning it’s better to add thin/incomplete layers than to overfill. Thinner layers allows the air bubble popping method of passing a butane mini torch or windproof lighter over the surface of the Magic-Glos for one and only one second. What this page is and isn’t about — It’s about fine art air-dry and polymer clays. It’s not about ceramic, cold porcelain, resin clay, epoxy clays, or any kiln-cured products. This page was written after reading https://www.reviewstream.com/reviews/?p=155083#thoughts-box, which was about Premier clay, which is an artist grade air-dry clay, and the beginner’s needs and understandable confusion. Durability… While people making charms often use various air-dry clays, they usually don’t construct bracelets or rings out of air-dry clays. Jewelry may take much more wear and tear. Cracks in Premier clay.… Cracks don’t mean your air-dry clay is weak. Premier is one of the strongest air-dry clays. Nearly all air-dry clays have some shrinkage and Premier is no exception, although it shrinks less than some air-dry clays. Having a good armature, if armature is necessary, and using minimal amounts of water while sculpting with Premier can decrease the likelihood or severity of cracks. Sometimes cracks happen but they’re easily be repaired with Premier, even if your item dried. See the below video. Cracks may occur if you added too much water while sculpting, used a cardboard armature, used thin clay over a rigid armature (Ostrich legs, for example), let your item dry too quickly, or didn’t support sculpture parts subject to gravity. Don’t dry your Premier clay items under a fan, for example. Do remember to keep unused clay in an air-tight bag and/or container. For figurative works, Premix, an air-dry clay made by the same company as Premier, is easier to sculpt and blend than Premier. Doll artist Hannie Sarris loved Premix clay. Premier clay may take some different sculpting techniques than what one would be used to with polymer clay and one uses minimal (!) amounts of water are used while sculpting Premier. People working with these air-dry clays might lightly dab their fingers across a wet sponge to keep clay moist enough while sculpting. They may use a mister type of water bottle. Do not use Sculpey Clay Softener or any type of oil to soften, smooth, and blend these air-dry clays — they are hybrid clays and have their own characteristics, sculpting techniques, storage and compatibility considerations. They’re not like the majority of polymer clays that are oven-cured (e.g., Fimo Classic, Fimo Soft, Cernit, Fimo Doll, Premo!). They’re not like most air-dry clays on the market. They are used by a number of very famous art doll artists and others. So yes, there are indeed air-dry polymer clays — Activa Lumina Translucent Polymer Clay, Staedtler Fimo Air Basic Modeling Clay, and Activa LaDoll Premier clay are examples of air-dry polymer clays. Activa, the company that makes laDoll Premier clay, describes Premier clay as a type of polymer clay on their site. Lumina has long been known to the polymer clay community. Fimo Air Basic is weaker than either of those. Polymer clays have their own issues — Dirt, lint, hair, compatibility issues, and baking considerations (always monitor your oven with two oven thermometers, not counting the oven’s own temperature reading). If you look at it that way, a few easily repaired cracks in Premier clay items isn’ts a bad deal. In contrast, Makin’s, Hearty, Das, “cold porcelain” clays, Creative Paperclay, Celluclay, and epoxy putties are not polymer clays no matter who describes them as such. http://www.garieinternational.com.sg/clay/shop/tension_test.htm — Which polymer clay is strongest? …Or go to clay manufacturers’ sites and hit their FAQs and MSDS pages. I wish there were sculpting, storage, compatibility, MSDS and other information (to seal or not to seal) with each clay package that one takes home, but that’s sadly not the case. Tagged About, activa, Cernit, clay diluent, clay oil, cracks, durability, Fimo Classic, Kato, LaDoll, learning curve, Lumina, polymer clay, Premier, Premix, Premo!, questions, review, Sculpey Clay Softener, Sculpey Premo! My Results From the Levo app regarding thinking talents. As you can see, it picks up on my autism-related deficiencies/differences/advantages. My relational quadrant is empty (not in real life), but then the underlying social constructs de rigueur these days overwhelmingly favor charming extroverts, the more gregarious a la neurotypical fashion they are the better. I see it offers are some pointers about things “relational” but ultimately for someone like me, this test may not pick up on social and communication alternatives. Here’s a TED talk that challenges Introverts with a capital “I” being placed at the top of whatever constructs we can devise without more penetrating examination. I tend to do my best thinking alone. That is core the body of any Venn diagram about myself). I don’t do well with snap decisions, often go through a vigorous fact checking process, may research a topic north south east and west, and need time to think through pros and cons. I prefer advanced notice about events or needed decisions. I need a good amount of alone time to do my best thinking, stay true to myself, and stay on track. As much as possible, I need to let people know I will get back to them on the topic or decision rather than keep them hanging. What do I need to work on: I need to devise purposely nurture relationships with “big thinkers.” Spending time with them will nourish and inspire my thinking processes. Since my relational skills are peculiar or lacking, I do best with other like people, meaning they are rather direct communicators who are or do well with those on the autism range. It seems I should partner with someone who excels in people, feeling skills and bringing things to action. That sounds like a neurotypical rather than someone who is on the autism range too. Neurotypicals usually shun people like me with a vengeance. What to do? I don’t want a relationship of unequals, so rather than some sort of setup that involves being mentored, I probably would do best in a co-mentoring relationship in which each recognizes the strengths and weaknesses of themselves and each other, without the ego trips or superiority complexes and other such baggage. Ideally. If I can’t get that, I can at least use a certified accountant and other specialists to help me get an art career off the ground. Keeping the above in mind, the below from my about me page may make more sense! I design and make figurative bead or art dolls, whip together spirit dolls, art journal, do fine art paintings, create mixed media mosaics, and get into some fabric arts! My blog pages reflect my intense, playful nature that leads me to intermittently research art mediums/techniques N, S, E, W, and outside the box for years on end so that I can readily dip my hands into multiple art mediums and play, sometimes exactingly and sometimes experimentally. To the core, it’s my nature to take things art further and I have no qualms about expanding and correcting my pages as new products or information comes along. Making art stirs up a deep-seated sense of awe, a child’s sense of wonder, a well-seasoned intellectual curiosity, and the sense that creation is a spiritual experience. Ideas for art constantly fly into my head and I keep notes. Days are never long enough. Sculpting figurative beads of polymer or earthenware ceramic clay, resin, making my own prototypes and molds, art dolls, spirit dolls, mixed media mosaics, art journaling, water-based painting, and bouts of fabric arts (cotton, Kraft-tex, paper cloth AKA fabric paper). Watermedia Warning: I’m an unabashed Cretacolor, Liquitex, Golden, and Da vinci fluid acrylics fan. Note: In any fine art, I only use water-soluble oil products on top of acrylics or watercolors, for final finishing touches, if I use them at all. Cretacolor — Artist sketching pastel pencils, carre hard pastels, sketching leads and holders, sketching powders. I can’t afford those! Nevermind. Sigh. I did unwittingly get Prismacolor pencils from after their factories moved to Mexico and too many leads fall out of the pencils or break. Grrr. I’m not so much in love with colored pencils, presently. English, Estonian, French, German, Swedish, Dutch, Norwegian, Punjabi, Spanish, and Italian. Punjabi, Chinese, Mexican, Greek, Estonian, French, American. Note that all my work is copyrighted and you may not use it without explicit written permission. Of course, it all starts with love, four words for love, then it covers reciprocity, examining what kind of power we have in our relationships from personal to public and political. After that, I talk about making reality according to will, because chances are, if we examine love, power, and reciprocity then we’ll want to make changes. First, I experimented with backgrounds made with acrylic craft paints. There are some neon, glow, and fluorescent colors in there. I added some mica misters (sprays) on top on some pages but not others. Uni Posca paint pens and “Moonlight” Sakura Gelly Roll gel pens were used on all pages so far. These particular gel pens don’t have to be sealed once dried but the Posca paint pens remain water-soluble and do best with several layers of Krylon matte sealant for that reason. The spray sealant also happens to solve the issue of acrylic painted art journal pages tending to stick together. I’m diving into some art journaling as I wait for my clay pieces to get fired. It’s taking quite some time as the art gallery’s kiln needed new parts and only recently got them. Because of that, they’re behind and still have to fire my pendants. I’m not doing anymore glazing until I know if this works out and what to expect. Art Journal. Words for Love from Agape to Praxis. Karen A. Scofield. 2016. Art Journal Spread “Words!” by Karen A. Scofield. 2016. Aphrodite Over Time. Goddess. Art Journaling. Grimoire is to spell or write. K. Scofield. 2016. Art Journal Pages. Karen A. Scofield. 2016. Credit for Law of Magic goes to Isaac Bonewits. Painting of an Anthropomorphized Sun Shimmer,” 24″x24″, by Karen A. Scofield. 2016. Black and white of Karen A. Scofield’s anthropomorphized sun. Tonal. Painting of an Anthropomorphized Sun Shimmer,” 24″x24″, by Karen A. Scofield. 2016. If you stare at the sun’s face, optical illusions come into play. It’s going to be in the next open show at Artworks Kenosha (WI). It has a bit of an optical illusion to it. I had done a study for the painting previously but the quality of work in this painting is far more professional and I painted while through a magnifying glass for a lot of this, not that doing so defines professional or fine art. I used an isolation layer using Golden Polymer Medium before varnishing it. Here are some stages of the work before completion. WIP Painting of an Anthropomorphized Sun Shimmer,” 24″x24″, by Karen A. Scofield. 2016. Good news! I have found out I can fire and glaze my beads locally. Probably do this in batches of a dozen each. Here is one that has finished drying and is ready for bisque firing. Note: This page will be updated as examples are made. The above picture is only a simple and fast test. It’s not meant to be a prime example, just an example to get your creative juices flowing (and mine). It shows a moon shaped piece of clay with a raised scratch foam design that was colored with Pearl Ex. I haven’t yet seen others doing it, but yes indeedy, spirographs can be used on scratch foam (Inovart Presto Foam Printing Plate was used in this case) with a ball point pen, ball stylus, or Sakura Gel Pen. Back at it, Dec. 2016. Create a design on scratch foam with a spirograph set and a ball point pen. Press polymer clay into the design and lift. Add bead holes, etc. You’re looking for spirograph sets that won’t make unintended scratches on the scratch foam. Mine came with “The Spiral Draw” Book. Pointillism elements or entire designs be be added inside or around the spirograph design with a ball point pen or ball stylus. The result creates raised clay designs once clay is preseed into it. Ball point styluses that come in varying sizes can be used for added interest and then needles or beed hole makers can be dragged across the surface, at a slant, to add on to the design too. Scratch foam designs are probably more commonly used for printing monoprints and other techniques … and also by metal clay artists. They can be earthy/rustic looking or linear and crisp ones. One can create a bezel complete with boarder designs, with scratch foam designs. What you indent on the foam will be raised on the clay. If you add dimensional writer designs to the scratch foam ones, the clay pressed into it will have both raised and indented designs. If you use Sakura Gel Pens for the spirograph scratch foam deisgns, many of their inks are oqaque and therefore show up on darker clays. You can press the clay into the fresh scratch foam design and then bake. You may want to seal your design afterward. 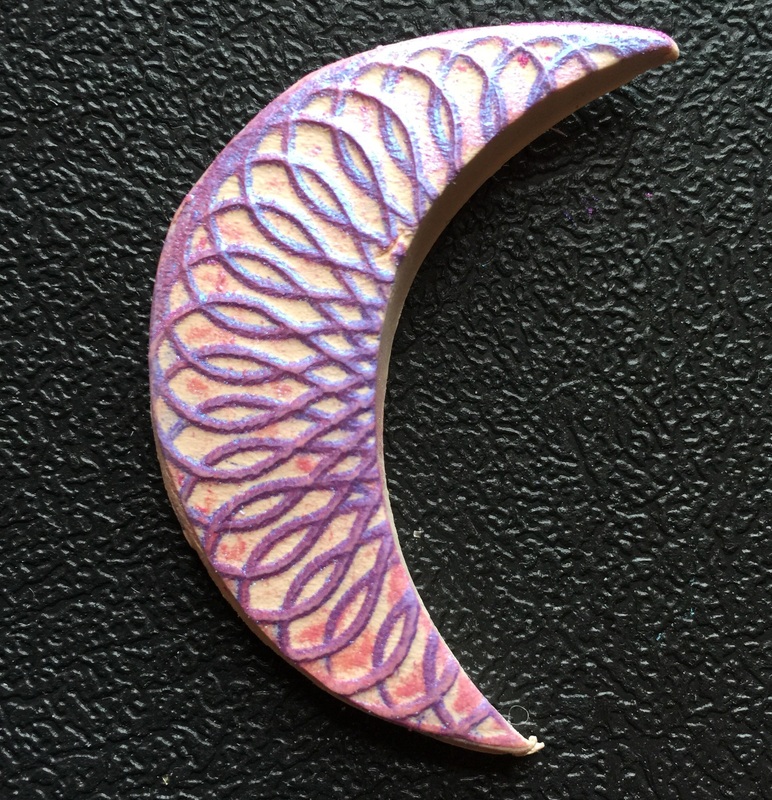 Any manner of polymer clay extrusions, applique, relief sculpture, lace impressions/molds, designs for faux enamels, crackling, or designs made with cutters/blades can be applied over the spirograph textured clay passages. If you’re worried about pressing clay together to cause adhesion, because you don’t want to ruin more delicate designs, you may want to use liquid clay or Bake and Bond for adhesion purposes. With single layer or multi layered scratch foam designs, you create mixed media mosaic tiles, embellishments, beads, and larger clay sheets. You can create molds of the larger clay sheets if you want. Raised designs can be colored with paint, Sakura Gel Pen ink, inks, or Pearl Ex powders (which are a brand of mica powder). I’d apply paint to baked clay but Sakura Gel Pen, Pearl Ex, and alcohol inks can be applied to raw clay that’s then baked. You may want to seal baked polymer clay items that have Pearl Ex mica powders or Gel Pens baked onto them. Varathane Water Based varnish is a wonderful sealant for polymer clay pieces.